Cleaning the litter box may not be the most delightful task related to having a cat. 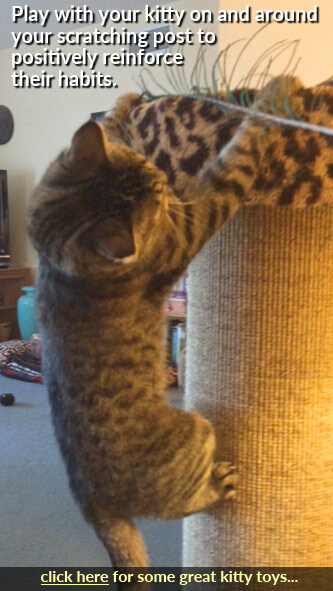 Still, it needs to be done (and done well) in order to keep your furry feline friend happy and healthy. Luckily, there are some tips and tricks that can make the task easier for you. The first step in creating your good litter box cleaning routine is acquiring the box. It's a good idea to choose a sturdy plastic box with nice straight corners that will be easy for you to get your scooper into. A large, flat storage box can work quite well as a litter box (without the cover). Many people prefer covered litter boxes because they hide the sights and smells inside the box. However, many cats don't like their litter box to be covered because it traps the scents into the small space, making them too strong for their heightened senses. Some cats have trouble fitting into the position in which they like to eliminate when there is a cover on the box. A cover also creates an extra thing for you to clean routinely. Still, covered models used without the covers make great litter boxes because they have high sides to keep litter and waste contained and easy entryways for your kitty to get in. One of the most important things you can do to make litter box cleaning easier on yourself is to invest in a great scooper. Scoops that break easily under the weight of clumped litter, rust over time, or cause you hand, wrist, and forearm strain will create a more difficult task that you are likely to avoid. 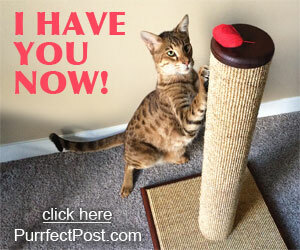 At PurrfectPost.com, our favorite scooper is the Durascoop. It is made of aluminum, so it won't rust. It's extremely durable and won't bend or break when you are scooping up heavy, urine-clumped litter. It's also deep and wide, so it is a very efficient litter scooper, making shorter work of an unpleasant task. The edge of the Durascoop is designed in such a way that it scrapes the sides and bottom of the box exceptionally well without flicking any litter around. The handle is ergonomically shaped so you will be less likely to experience hand or wrist pain when you're using it. Another great system to consider when you are looking for a litter box scoop is one that self-contains much of what you will need to have near you to accomplish your task. An example is this Litter Buddy 4-In-1, which combines your scoop, broom, and dustpan together on a convenient mount. This product is great because it allows you to have designated equipment for the litter box cleaning task and keeps it all together for you. Taking the time to find a good mat on which to place your litter box can decrease your cleaning time and keep the mess contained. At PurrfectPost.com, we love this one: Perfect Litter Mat. It will fit under almost any litter box and extend out on all four sides. This means that, when your cat steps out of the box, any litter that's stuck to her feet will be dislodged and stay there rather than be tracked around your home. Stay away from regular bathmats or towels because it can train your kitty to eliminate on them when she finds them elsewhere in your home, such as the floor or the laundry basket. One of the ways to make your litter box cleaning task easier is to do it more often. This might sound counterintuitive, but the longer you leave the box messy, the harder it is going to be to get all of the urine and stool out of it. Procrastinating also makes it more likely that your cat will develop an inappropriate elimination problem, which will really cause you increased cleaning time, trying to get messes out of your carpet, laundry, or bedding. Warning!! Pregnant women should not clean litter boxes due to the danger of toxoplasmosis infection. Toxoplasma gondii is a parasite that can spread to humans and other cats through egg spores present in cats' feces when they are infected. While most cases of toxoplasmosis in humans do not cause illness, the agent can cause birth defects when a fetus is exposed to it. Daily scooping and disposing of litter helps to decrease the risk that a person will be infected with Toxoplasma gondii because the spores require incubation for several days before they develop the ability to infect someone. If a pregnant woman must clean the litter box, it is imperative that she does it every day, wears disposable gloves, and washes her hands thoroughly afterward. However, if you are pregnant, you should check with your doctor for specific recommendations. The threat of contracting toxoplasmosis is also present when women are gardening (outdoor cats love to use gardening beds as litter boxes) or consuming undercooked meat. Pregnant women should wear gloves while gardening and eat only well-cooked meat. Scoop your cat's litter box once a day or more. If you have multiple cats using the same box, you may need to do it more. The more often you do it, the less overall time it will take because it won't be as dirty each time. It's a good idea to wear disposable gloves (choose the right size for you) while performing this task, and some people like to wear a mask. Below, we've outlined a good procedure to follow for daily litter box cleaning. This technique assumes that you are using clumping litter. For non-clumping litter, you can follow some of the same steps, but you will also need to drain out any urine present and you will probably need to replace the litter more often. Sift and Scoop. 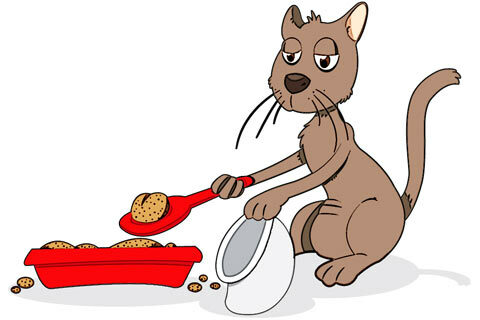 When it's time to clean the litter box, the first thing you'll want to do is scoop out any solids. Take care to ensure that you get all the way to the bottom of the box, removing any trace of waste. Be sure to have a garbage receptacle ready and within reach to receive the used litter. You don't want to be walking across the room with each scoopful, trailing litter and who knows what else along behind you. Tip and Tap. The tip and tap technique helps you get any urine-clumped litter that might be hiding in the corners of the litter box. Simply tip the box at about a 45° angle on its side so the majority of the litter moves out of the way, and give the box a little tap. Scrape and scoop out anything that comes loose, and repeat the procedure on the other three sides. Wipe and Wash. As you tap the litter away from each side of the pan, if you see anything stuck to the sides or bottom, use a wipe to clean it off. Make sure to use a type that is non-toxic to cats. Dump and Dust. 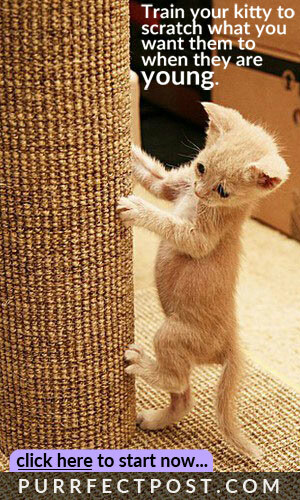 Now is a good time to clean any wayward cat litter out of the mat on which your litter box sits. Be sure you have a sanitary spot to place the litter box while you perform this part of the task. Dump the mat out into your garbage receptacle, dusting it off with the broom dedicated to litter box care if necessary, and use the pet wipes if there is anything stuck on it. You should scrub the mat with mild dish soap and water periodically as needed. Replenish and Rake. You'll want to add enough fresh new litter to the pan to make up for what you removed when you cleaned it. Smooth out the new litter so it's nice and inviting to your kitty. Sprinkle and Stir. You can sprinkle a little baking soda into the litter if you wish. Stir it in to help absorb odors until you scoop again. About once a week or so (possibly more often if multiple cats use the box or less often if you are diligent about cleaning it daily), you'll want to get rid of all the litter in the box and clean the box itself well, then fill it with fresh, new litter. When you do this, don't use straight bleach, ammonia, or citrus-based cleaners. These can all be too strong for your cat and result in litter box aversion. Ivory® soap is great for cleaning the litter box, or you can make a paste with a little baking soda and water. You can use a dilute bleach solution (1 part bleach to 9 parts water) to rinse the box after you've washed it. Rinse it well with plain water afterward so there is no residue which may end up in your cat's mouth when she licks off her paws. Make sure the box is completely dry before you add new litter.